The Uttar Pradesh government on January 17 decided to start Metro services in Agra, Kanpur and Meerut cities by 2024 at a total estimated cost of Rs 43,800 crore. 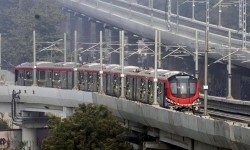 The decision comes close on the heels of the Adityanath government giving its approval for the setting up of the Uttar Pradesh Metro Rail Corporation, which will be set up on the lines of the Maharashtra Rail Corporation. Taking the government to task for not implementing a law meant for the welfare of construction workers, an exasperated Supreme Court on January 17 asked it to formally state that the orders passed by the top court in the matter were "thrown in the dustbin". The apex court questioned the Centre's attitude on the issue, and said it was clear that the Building and Other Construction Workers (Regulation of Employment and Conditions of Service) Act, 1996, could not be implemented at all. Real estate company Puravankara on January 17 said it would invest Rs 600 crore to construct an affordable housing project in Bengaluru. The project, having 2,100 units, will be developed on a 20-acre land parcel, owned by Keppel Puravankara Development, a joint venture between Puravankara and Singapore-based Keppel Land.